"The Preferred Geology & Soils Firm in West L.A."
Bay City Geology, Inc. is an engineering geology and geotechnical engineering firm providing geology and soils reports for submittal to government agencies for building permits and to design consultants for construction intent. 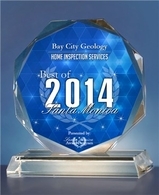 We also provide escrow geology reports also known as geologic inspection reports for prospective home buyers. Competitive Prices and Rapid Turnaround to Receive Report. We are licensed engineering geologists and geotechnical engineers. Our geology and soils reports will provide foundation recommendations and slope stability analysis for your hillside development project. We also specialize in liquefaction analysis for sites located within mapped liquefaction zones. Bay City Geology, Inc. is committed to providing cost effective geotechnical recommendations tailored for each specific project. Specializing in new construction, room additions, seismic fault investigations, liquefaction analysis, retaining wall investigations, private sewage system investigations, landslide repair, and distressed dwelling foundation investigations. Also providing deputy grading observations for the City of Los Angeles.